How Big Is a 40 Yard Dumpster? 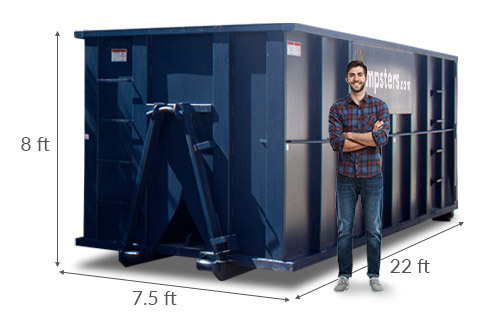 The usual dimensions of a 40 yard dumpster are 22 feet long, 8 feet wide and 8 feet high. It can hold up to 40 cubic yards of debris in volume, which is about 240 13-gallon trash bags. A 40 yard dumpster typically has a 5-6 ton (10,000-12,000 pounds) weight limit. Disposal costs for this amount of debris are included in our flat-rate price. As a reference point, a toilet can weigh up to 120 pounds and granite countertops average 18 pounds per square foot, so keep in mind that weight can add up fast. What Does a 40 Yard Dumpster Cost? A 40 yard roll off dumpster costs between $350 and $783 on average. Our flat rates include delivery, pickup, taxes and disposal up to your container’s weight limit. But keep in mind that exact pricing for a 40 yard container will depend on your location and the type of debris you’re throwing out. Our biggest dumpster size, a 40 yard bin suits a variety of large-scale jobs. 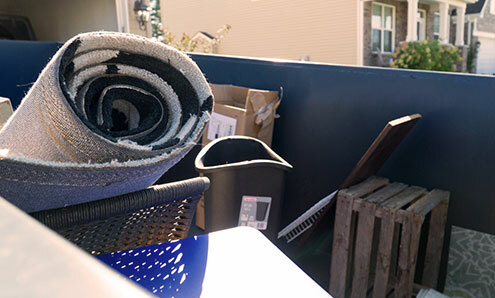 Whether you’re planning a building demolition or a major home remodel, a 40 yard roll off dumpster is a simple waste management solution for contractors and property owners alike. Check out the video for more information or talk to a real person to get a quick quote. Is a 40 Yard Cubic Yard Dumpster Right for Your Project? Renovating a large kitchen or entire floor. Cleaning out an entire home. Removing materials from hoarding situations. Decluttering attics, basements and garages. Please note that covered weight limits and accepted items may vary by location. Not Sure a 40 Yard Dumpster Is Right for You? If you don't think a 40 yard roll off dumpster is the best fit for your project, we have other size options. Use our [weight calculator](https://www.dumpsters.com/resources/dumpster-weight-calculator) to estimate how much debris you have, or just give us a call at [844-444-DUMP](tel:+1-844-444-3867). 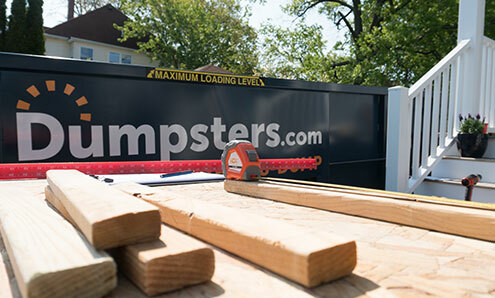 We rent dumpsters to DIYers and contractors working on a huge range of projects. Your team member will ask the right questions to help you make the best choice for your specific needs. And if your needs change as the work progresses, you can schedule a swap-out or rent additional containers with just a quick call to their direct extension. Keep the following guidelines in mind so your delivery and pickup go off without a hitch. Decide where you’d like to place the dumpster. You’ll talk this over with a team member when you set up your rental. For a 40 yard dumpster, about 60 feet of space is needed leading up to the drop off area and an overhead clearance of 23 feet. During delivery and pickup, make sure your container isn’t blocked by parked cars, locked gates and other obstacles. 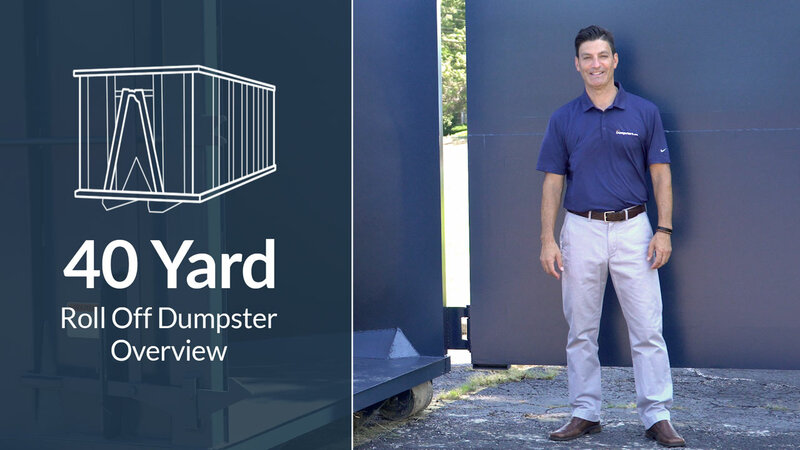 After you order your 40 yard dumpster, one of our team members will send you a follow-up email with what to expect, a copy of your invoice and a list of prohibited items to avoid placing in the rental. If you have any questions along the way, just give our team a call.